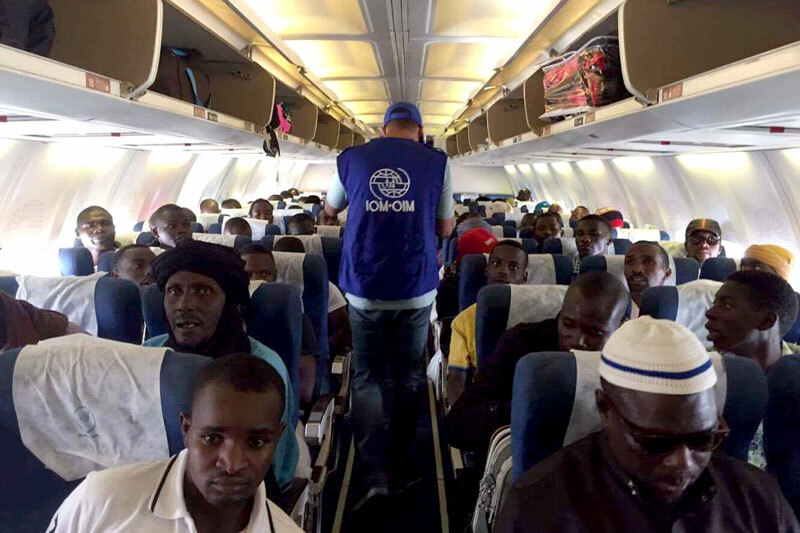 Libya - On 1 November, IOM assisted 167 stranded Nigerien migrants including 48 women, 40 children and 79 men, to return home to Niger from southern Libya. The IOM charter flight was coordinated in close cooperation with the Libyan authorities, the Nigerien embassy in Tripoli, its consulate in Sabha, the Libyan Red Crescent in Sabha and IOM Niger. It departed from Tminhint airport, 30 kilometres from Sabha and 750 kilometres south of the capital Tripoli, and arrived in Niamey airport in Niger the same evening. IOM interviewed the migrants before they departed and provided health checks to ensure that they were fit to travel. They included Samira, 31, who left Niger with her family. Samira came to Libya looking for work and a better life. Back in Niger she plans to finish her studies and become a doctor. Another returnee, Aicha, 34, lost her husband in an armed confrontation in Libya. She was left alone with her five-year-old son, with no means to provide for herself or her child. She plans to rejoin her family in Niger. The charter was IOM Libya’s second humanitarian repatriation from southern Libya. The operation was funded by the UN Central Emergency Response Fund and the Norwegian Ministry of Foreign Affairs.